Graphic arts engage readers in a way text cannot. Told with sequences of pictures, along with narration and dialogue (often in the form of speech bubbles), graphic arts have become increasingly popular media for education and communication as well as social commentary. From disaster preparedness to questioning high-tech medical advancements, comics and other forms of graphic art are effective in sharing information and insight. For some, they are a more accessible format as they encourage readers to develop critical thinking, cultural literacy, and a motivation to engage in individual and social change. In 2011, the Centers for Disease Control and Prevention (CDC) developed a free downloadable comic book, Preparedness 101: Zombie Pandemic, as a way to help prepare the public for general emergencies. 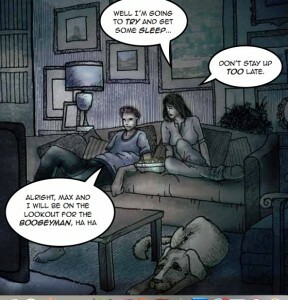 The 40-page graphic novella tells the story of a young couple and their dog during an escalating zombie apocalypse who manage to stay safe with the help of the CDC’s disaster preparedness instructions. The vivid images focus the reader’s attention, and the story line is clear and compelling. The images and text are geared toward a range of literacy levels and cognitive abilities and together promote recognition and recall. Yes, we’ll stay right here and wait for instructions! The graphic tale conveys this specific information as it creates an emotional connection with readers to motivate behavior. Message sent, and received. People learn in different ways and for some, visualizing a message is more compelling than seeing words on a page. In a culture bombarded by images, we are increasingly conditioned to learn through visual entertainment. Graphic arts take the form of this “entertainment” to inform and engage, and to incite action. “Notification! 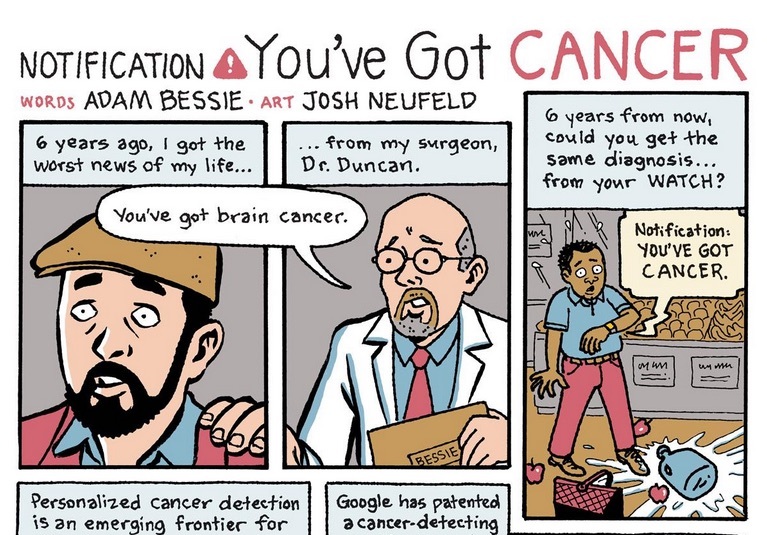 You’ve Got Cancer” is a comic strip by Adam Bessie and Josh Neufeld that provokes critical inquiry into an important social issue, the rise in medical technology and biomedical surveillance. The short comic strip suggests that advances in high-tech cancer detection might get so invasive that someone could potentially receive a text message about some new diagnosis via smart device. The narrative does not go into detail about the practical or emotional implications of such advancements. It merely suggests that biomedical surveillance has become so increasingly routine, with patents on new technologies emerging at record speed, that the technology of cancer detection is likely here to stay whether we’re prepared for it or not. Adam received his brain cancer diagnosis from a doctor. Imagine getting news of your cancer diagnosis on your watch while shopping for fruit! 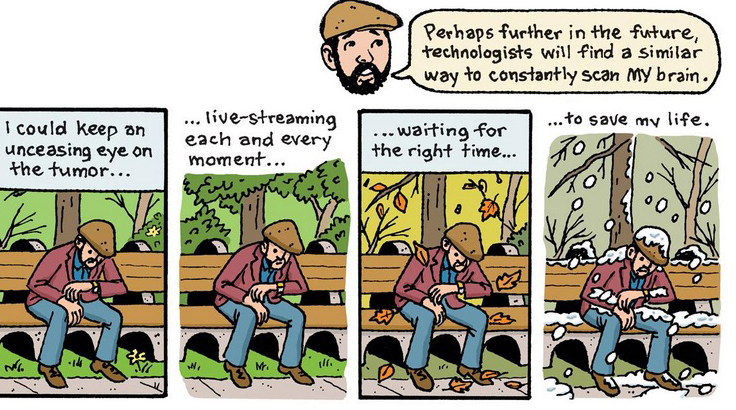 This take on technology’s reach is not far fetched. The comic strip makes mention of recent developments such as GOOGLE’s newly patented cancer detecting pill and the iT bra that supposedly detects breast cancer using a smart phone and cloud-based analysis. A flippant sequence featuring the author moves the reader’s attention beyond the shock of impersonal, inopportune diagnosis toward another serious flaw: personalized detection technology outpaces successful treatment. In pointing out this problem, Notification! raises a crucial question about the technological imperative, or the inevitability and necessity of new technologies. Namely, is it necessarily for the greater good? The authors suggest that there may be little to gain in live-streaming one’s tumor and waiting to be saved. What’s more, the matter illuminates the uncertainty that inherently exists in technology and biomedicine. Biomedical uncertainty refers to the ways in which knowledge is limited about how to prevent, diagnose, and treat a varied range of diseases and conditions. This shouldn’t be news. Talcott Parsons argued in 1951 in The Social System that the incessant advancement of science and medicine increases biomedical uncertainty as doctors rely more fully on scientific advancements and specialized technology to consult with patients and construct diagnostic and treatment protocols. Yet technological advancements march along while indeterminate diagnostics, controversial medical evidence, and ambiguous treatment outcomes are often a stark and surprising reality for the diagnosed. As the biomedical enterprise colonizes greater expanses of health and illness domains, it must move ethical and practical considerations such as those discussed in this comic strip to the heart of its research and development. Otherwise Adam’s future stressed out descendants might find themselves live-streaming their tumors on their fit bits while recording their gradual demise on their Snapchat Spectacles.